With increasing restrictions across Italian cities aimed at curbing tourists’ unruly behavior, Venice and Florence have both launched campaigns to accomplish that goal, called #EnjoyRespectVenezia and #EnjoyRespectFirenze, respectively. The message, sent through fines and increased awareness, is common sense: Respect the city, its history, its art and its residents. 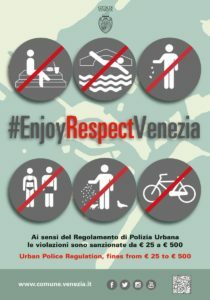 The Enjoy Respect Venice campaign launched in July with a set of rules prohibiting misbehavior and encouraging good behavior, illustrated on posters put up around the city. Among the banned activities are swimming in the canals, picnicking in public, littering, riding bikes through the city, sightseeing in bathing suits, and loitering on bridges. Suggestions for appropriate behaviors include highlighting official public picnic areas and public bathrooms. Paola Mar, Venice’s tourism councilor, launched the campaign in 10 languages. Fines for violating the rules range from 25€ to 500€. Florence quickly followed suit with its own Enjoy Respect Florence campaign, launched in August by the city’s tourism chief, Anna Paola Concia. The Florence campaign enforces similar rules as in Venice: no littering, defacing monuments, buying counterfeit goods, or sitting anywhere except public benches and intended seating areas. The Florence campaign is illustrated with stick-figures showing thumbs-up and thumbs-down symbols. To drive the point home, Florence printed these images on T-shirts, mugs, key chains, and tote bags and gave them to hotels, restaurants and tour guides to pass out for free to tourists. The behavioral campaigns are the latest in a series of tactics Italian cities are trying this year to lessen the crush of mass tourism. Florence is hosing down church steps at lunchtime to stop people from eating on them. Venice is mulling an entry fee to its historic center, a ban on cruise ships, and a cap on annual visitors. Rome banned a multitude of misbehaviors at 40 of its fountains and several monuments, and is heavily patrolling the Trevi Fountain to keep tourists’ conduct in check. The rules aren’t meant to make tourists feel unwelcome, but rather to manage growing numbers of tourists and restore decorum to Italy’s elegant and historic cities. Locals’ reactions have been positive, as they have been frustrated with the lack of respect shown by some tourists. In Venice, the 30 million tourists who come each year vastly overwhelm the 55,000 permanent residents. “It used to be wonderful, we had lots of artisans … the problem now is the mass tourism, the people who come for just a few hours and see nothing – it’s as much of a nightmare for them,” Venice resident Luciano Bortot told The Guardian of his city in July.